The Left Coast Crime geographic region includes the parts of the US and Canada in the Mountain, Pacific, Alaska, and Hawaii Time Zones. 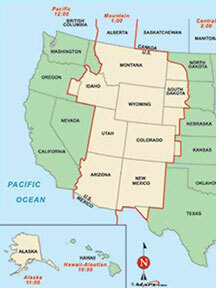 The LCC region includes the entire states of Alaska, Arizona, California, Colorado, Hawaii, Idaho, Montana, New Mexico, Nevada, Oregon, Utah, Washington, and Wyoming. Also included are parts of North Dakota, South Dakota, Nebraska, Kansas, and Texas. The LCC region includes the Canadian provinces of Alberta, British Columbia, the Northwest Territories, and Yukon.